Finally, NetOne has stepped up to the plate, and not a moment too soon actually. The mobile network operator launched its own Over The Top (OTT) service bundles, or more specifically WhatsApp and Facebook bundles. The modus operandi is the same: Give subscribers unlimited access to the most visible applications or services and have them pay for it, network neutrality be damned. It’s a win-win situation actually. 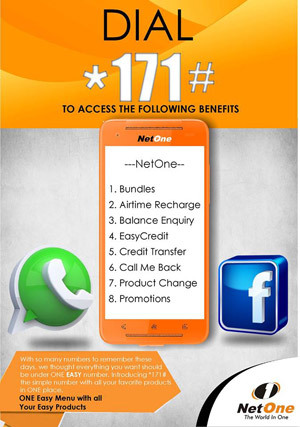 NetOne will steadily boost its Average Revenue Per User and maintain broadband subscriber numbers while the subscribers get cheap access (At $5 for a monthly combo, NetOne is offering its bundles at a lower price than its competitors’ Econet and Telecel) to Facebook and WhatsApp services. It adds a lot of value to NetOne subscribers when you consider the access to video and other multimedia services that would have cost an arm and a leg on an ordinary data subscription. I find it difficult to place faith in State-owned enterprises, but perhaps this could be the start of better fortunes for NetOne. Of course mobile network renaissance can’t be pinned on just two OTT services, but the network has more lined up for its data services in the medium to long term that shows a lot of promise. The NetOne network expansion project which has a strong focus on LTE and broadcast services could be part of the point of difference NetOne needs to go toe to toe with Econet and Telecel. Competition is supposed to be on value and not price. It’s the same sentiment that the NetOne CEO Reward Kangai was sharing last week at eTech Africa as he gave a glimpse of the vision for data services delivery the MNO has. At the end of the day, this is shown in the simple but effective services like these bundles and hopefully an LTE rollout that actually makes the service available to everyone. With voice revenue not as alluring, the mobile telecoms race is for the best services in mobile money and data. Ironically If NetOne can make services like WhatsApp calls work effectively, it could become a force to reckon with in broadband. So your article says LTE NetOne goes all out… Partial click bait here. There isnt a single lte cell online from net*one available to public. Why dont you change it to Net*One Bundles. There is no talk of other social media, we are talking google, linkedin, instagram etc. The only network that has gone all out is Africom!